Baya 5pc Diaper Bag Sets only $22.95 (Reg $90) + Possible Free Shipping! 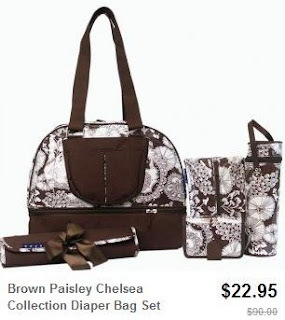 Baya Diaper Bag Collections are being sold on Totsy right now for only $22.95. These 5-piece sets regularly cost $90! Equipped with a quick access pocket on the outside for your cell phone and keys, this handy bag is loaded with multiple pockets, a changing pad, matching wallet, cosmetic case, insulated bottle holder and separate bottom compartment for extra storage. If this is your first Totsy purchase within 30 days of registering, you'll get free shipping! If you know someone who is expecting, this would make a great shower or holiday gift! NOTE: You can find these bags in the "Baby Essentials Event" sale.